The fluidisation of powders, using compressed air through a porous media to make them flow like liquids, is a process used in many industries. Applications for this process are found in the pharmaceutical, food, beverage and construction markets to move powders such as drugs, flour and cement, as well as to efficiently empty silos, road and rail tankers. Cereals, icing sugar, coffee, flour, cocoa powder, hydrated animal foodstuffs, starch, milk powder, paracetamol and vitamins. Cement, gypsum, silica, resin bonded sand, sulphur, soda ash, pulverised fly ash, coal dust and glass beads. Pigments, carbon black, titanium dioxide, anti pest powders, calcium carbonate, detergents, PVC, EVA, polyethylene, epoxy and polyester paint powders. Working in partnership with engineering contractors, OEMs and end users, Porvair Filtration Group work to achieve optimum solutions and customer satisfaction. Offering compact economic design and minimal maintenance our range of systems is suited for use with dryers, mixers / blenders, granulators and fluidised beds in high temperatures and chemically aggressive environments. 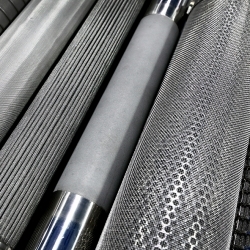 The material technologies that Porvair Filtration Group can bring to the powder handling industry are one of the largest currently available from any single manufacturer. Whether it is Vyon® sintered porous plastics, Sinterflo® sintered porous metals or Sinterflo® sintered metal meshes, we can produce a wide variety of structures (including flat beds, cones and domes) to fit most assemblies.